New Delhi (Agenzia Fides) - Christians in India, especially in Uttar Pradesh, India's most populous state, fear new attacks by Hindu extremist groups. In a document sent to Agenzia Fides, the Commission for Religious Freedom of the Evangelical Fellowship of India (EFI) notes that the state governed by the Hindu nationalist Bharatiya Janata Party (BJP) under the leadership of Prime Minister Yogi Adityanath recorded 44 episodes of violence against Christians in the last two months, while another 71 incidents have been documented in the rest of the Indian nation. A total of 195 accidents documented from January 2018 to October 2018. Uttar Pradesh - where over 220 million citizens are largely Hindu, Christians represent 0.18% of the population. 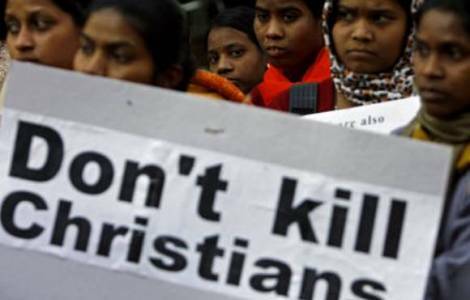 As Fides learns, violence against Christians is due to a "systematic campaign" carried out in the district of Jaunpur, in which Christian missionaries are accused of converting hundreds of poor villages to Christianity. The document sent to Fides reports: "The police and militant groups interrupt services of worship and harassed the faithful. The police block the streets and discourage people from attending Christian liturgies. Hindu extremist groups raid churches, but police filed complaints accusing priests of proselytizing by force or fraud". Commenting to Fides the EFI report, Jason Keith Fernandes, a Christian anthropologist from Goa, says: "The list of attacks by Hindu nationalist groups is disturbing: it is urgent to appeal to state authorities, in particular to the Prime Minister of Uttar Pradesh, to ensure that the state protects vulnerable groups. The inability of the police to guarantee order, freedom and the rights of all is a concern not only for Christians but for all citizens of the state. It may be a sign of the erosion of the liberal state in India". John Dayal, a secular Catholic leader and human rights activist, said: "Uttar Pradesh is now considered by the ruling party, the BJP, and by Hindu extremist groups, such as Rashtriya Swayamsewak Sang (RSS), the place where the experiment to create a Hindu nation is having success. The BJP ruled states like Madhya Pradesh and Chhattisgarh for 15 years, but this plan failed. In Uttar Pradesh they gained total control, they elected a religious fundamentalist as Prime Minister and silenced other moderate religious leaders and other minorities". "Violence against Christians - continues Dayal - is part of this program, I am afraid that we will see attacks and a more widespread intimidation in the months close to the general elections of May 2019".